Magento custom designed gallery plugin contains two modules. You can guess, one is for displaying images on frontend and second one is for handling images and categories in backend. I will not write too much about this modules because there are too much files and it will take too much time to describe. Most of things used in this modules are already described by my working colleagues. Backend module is based on interface for adding images of products in magento shop. Images on frontend handles Inchoo_GallFront module. (rememer that this is based on default frontend theme so do not forget to copy this files/folder if you use another theme). All you need to do is rearange categories and images on frontend. In ‘gallery/demo.phtml’ file you have two arrays which you have to modify and display pictures from categories as you wish. Can Some one provide download link to the usefull code. Heard its a great tool, but couldnt able to download the module, the gives server error. I got this module and installed in magento 1.6. But when i clicked and uploaded images but it didn’t work. I used the above custom module in magento 1.7 but image not uploading it adds the category but image not going to uplaod. Please help me..
Any ideas to update to 1.7? Extension giving problem to save images. Please help! I just installed successfully the extension and on frontend I exactly have the same window than you with the 2 array. But what we have to modify to show the gallery and not the code ?? Can you put an example with one picture please ? 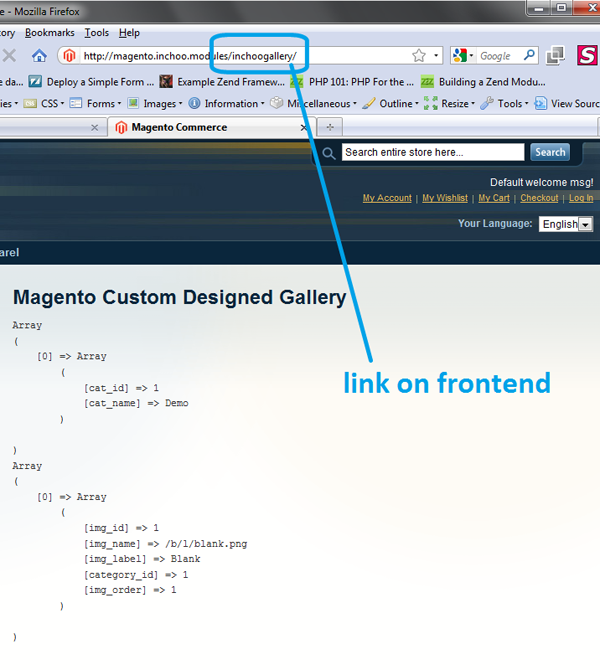 Hello Friends, Can some one post some kind of example to be able to call the gallery somewhere in the magento. Thank you, because I did not understand how to do it. I have the same issue as Kristina. It is a great module, but disappointing that the developer cannot provide an answer to this issue. Thanks for posting this solution. The modules are working as expected. I’m looking forward to getting under the hood and seeing how things work. Hi there, I know it’s been awhile since someone posted, but I must be missing something – I’ve put the files in but Inchoo Gallery is not showing my admin? I’m running Magento 1.4.2.0. Any thoughts? Is there something I need to do besides uploading the files via FTP? Hi Thanks for share such a good article …………..
i have used this but in admin area its not showing the image upload and save option, only show the no image but there are one entry into DB..
will you help to me for resolve this problem…. please calrifay to me more about it. I like the inchoo products, i’ve used the featured products at my site and i’d like to use the gallery also. I have a problem regarding this gallery module, every this working fine, but when i assign only this role to particular user then this will not listed in that user admin panel. Please resolve this issue, i am very thankful to u. Think I’m missing something here, as all it returns is the two arrays. Anyone got an example of how they are displaying their images and not just the array text.. yeah i know, im a dunce. I managed to solve it. This custom module creates 2 tables in DB and then uses SQL sentences to retrieve data. 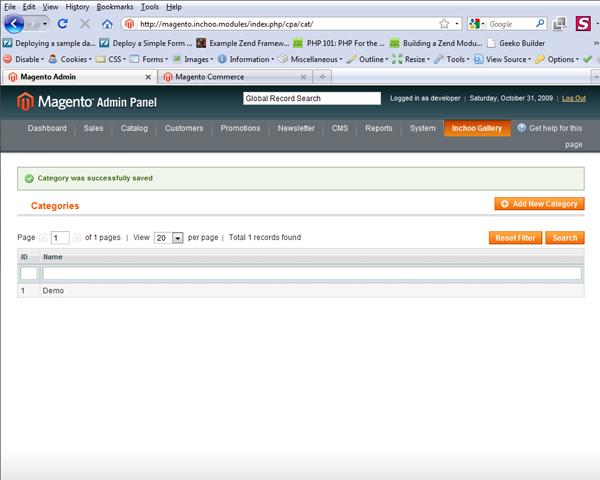 I set my Magento store to add a prefix “mage_” in front of every table. So in file \app\code\local\Inchoo\Cpa\controllers\CatController.php there are these sql sentences and in front of every DB table name I put “mage_”. So “inchoo_cat_images” now becomes “mage_inchoo_cat_images”. “CatController.php” is the only file where you should add prefix. Hi Inchoo team, thanks for the code, as usual really helpful. I’m sorry to say I’m having some problems :-/. I can’t seem to save images. I can browse and upload them, assign a label but when I click Save button it exits to category page and returns an error “Category allready exists”. I also tried to remove the demo image, and it doesn’t seem to work. I tried to debug it , $this->getRequest()->getPost() contains name of existing category and demo image but no info on new images. I have Magento v. 1.3.2.4. I’ll be grateufl for any kind of suggestions… Thanks! No Matte, thank you for your reply. Amazing plug-in, you saved my life! Here is working example of overriding controllers, Models and Blocks which developed my working colleague Branko Ajzele. I want put this gallery into my home page (not in inchogallery). Ho I can do it? Thanks!